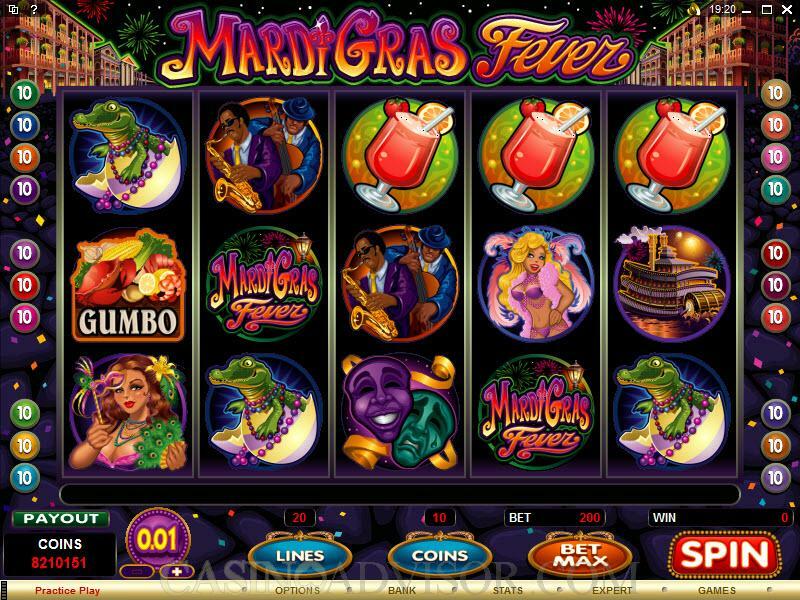 Mardi Gras Fever is a video slot game offering from Microgaming, a brand that means a great deal in the world of online casino software. This is a five-reel game, with 20 paylines, and you can make a maximum wager of 200 coins. In this game you have the opportunity to take advantage of not one, but two different scatter symbols. There are also two different bonus games, one of which offers free spins and big multipliers on wins. "Scatter" symbols are symbols that do not have to appear on an enabled payline in order to have their effect. Mardi Gras Fever offers two scatter symbols - the Bourbon Street symbol and the Jester symbol. Mardi Gras Fever has two different bonus games. 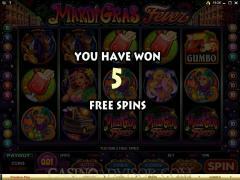 There is the Mardi Gras Bonus Game, which becomes activated when three or more of the Bourbon Street scatters appear anywhere on the reels; and the Free Spins Bonus Game, which kicks in when three or more Jesters appear anywhere on the reels. The Mardi Gras Bonus Game puts 12 windows in front of you, at which time you have to select three of those windows, which have random bonus win amounts behind them. It's that simple. 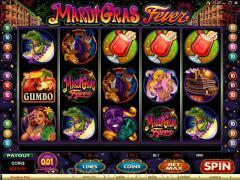 It is possible to win up to 12,000 coins in the Mardi Gras Bonus Game. The Free Spins Bonus Game allows you to get five free spins, but any wins on your part during those free spins will bring a payout that is multiplied by ten (10x). 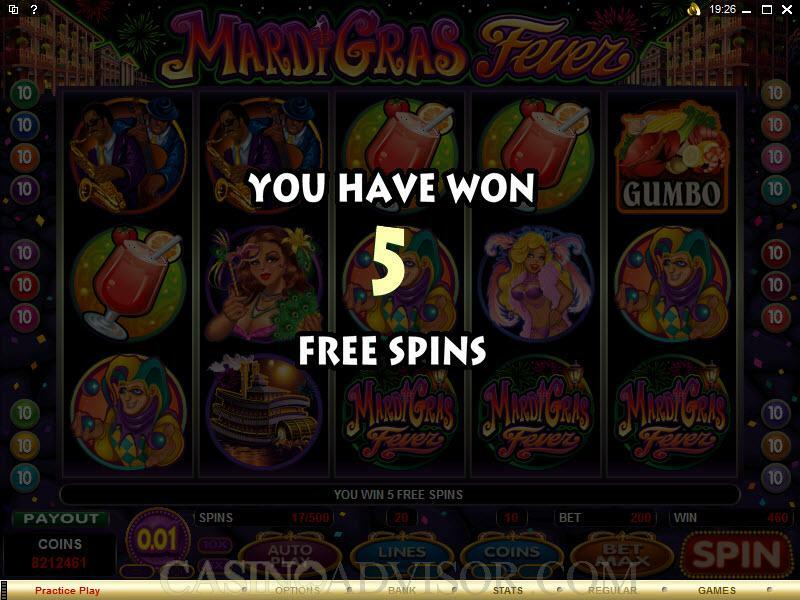 When three of either of the scatters (the Jesters or the Bourbon Street symbols) appear on the reels during the Free Spins Bonus Game, you will not win free spins, but will instead win a scatter symbol payout, which is multiplied as well. The maximum wager here is 200 coins, with a maximum of ten coins per enabled payline, and as always, you can click "Bet Max" button at the bottom and automatically be in a position to wager the maximum possible.. The coin denominations that can be bet are of different sizes: .01, .02, ,05, .10, .20, .25 and .50. Interested in reading more detailed information about Mardi Gras Fever? If so Click Here for more details.